I am very excited & yet humbled to be selected in the Athletes for Equality Program of the Human Rights Campaign Foundation! On November 4th, I will be running the 2018 TCS New York City Marathon (my second Marathon after Los Angeles) for HRC. And I am dedicating my training & the 26.2 miles in New York to Equality for All! 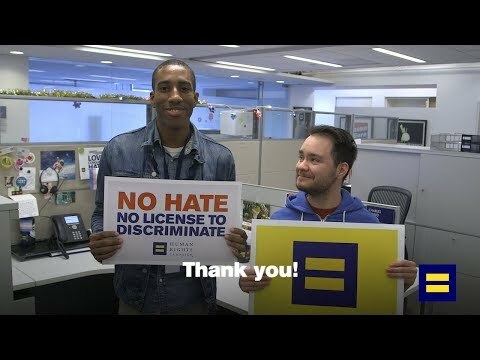 Every day, HRC Foundation works to enhance the lived experiences of all lesbian, gay, bisexual, transgender & queer (LGBTQ) including all our families to have a voice & equal opportunity across America & around the globe. I am looking forward to train, run & make my miles more meaningful by running for this amazing cause very close to my heart. In the Spring of 2017, my wife, KD & I got married, surrounded by our closest friends & family. It has been the best day of my life to be able to call my soulmate & life long partner... finally my wife. And I wish that same happines & fulfillment for everyone. Without the voice & advocacy of HRC, I probably wouldn't have that. LOVE IS LOVE & I believe that everyone deserves equal rights. If we share that same value & you are also a strong believer of EQUAL RIGHTS, please make a donation today. Each dollar raised will improve the lives of LGBTQ people by working to increase understanding and encourage the adoption of LGBTQ-inclusive policies and practices. THANK YOU! Your love & support will continue to inspire me to run my best, with all my heart & keep going all the way to 26.2! I want to join this team and agree to raise a minimum of $2500 by October 21, 2018.